​Today (Thursday) was our final day of class. We were involved in security meetings. In these meeting we met with different teachers from different areas of the college and asked them questions about the dangers in the area of the buildings they worked. Then we went to these locations and made up plans of how to make them safer. After this we said our goodbyes to our classmates and got a picture with our teacher Peter. ​The experience was eye opening and has changed all our attitudes towards how we approach our work. Each one of us has learnt new skills in communicating with people who speak different languages and working within a group dynamic. If given the opportunity again we all would definitely jump at it. Today in class we took part in a risk assessment workshop. In this workshop we learnt about how the Finnish security companies rate their risks compared to Irish companies. In Ireland we have a system where you rate the risk between 1-3 and here it’s between 1-5 and each number has a key meaning and a related response. After we understood how the system worked here, we went to a gun shop and a kids play area (like monkey business) as they wanted to hear about how our college could improve their risk assessment procedures in the case of different types of emergencies. This proved to be very interesting and something that we could put into practice when we return to GTI. In the gun shop we saw how all the guns were stored and where they kept all the ammunition. They told us they selected this area to set up the shop because of how secure it was. In the kids play area we were shown the fire safety plan for the building and afterwards we walked around the complex and mapped out all the fire exits. The difference in security and respect for security here in Finland compared to Ireland is huge. We are really learning a lot and know this will benefit us greatly in the future. Today in class we were in charge of creating a scenario which took the entire day to plan and re-enact. We organised a mock frisk search where the students had to search Eoghan and Evan. Evan had a fake I.D. and Eoghan had a fake knife. The way they searched was a lot more thorough and done at a higher standard compared to what is required back home in Ireland. 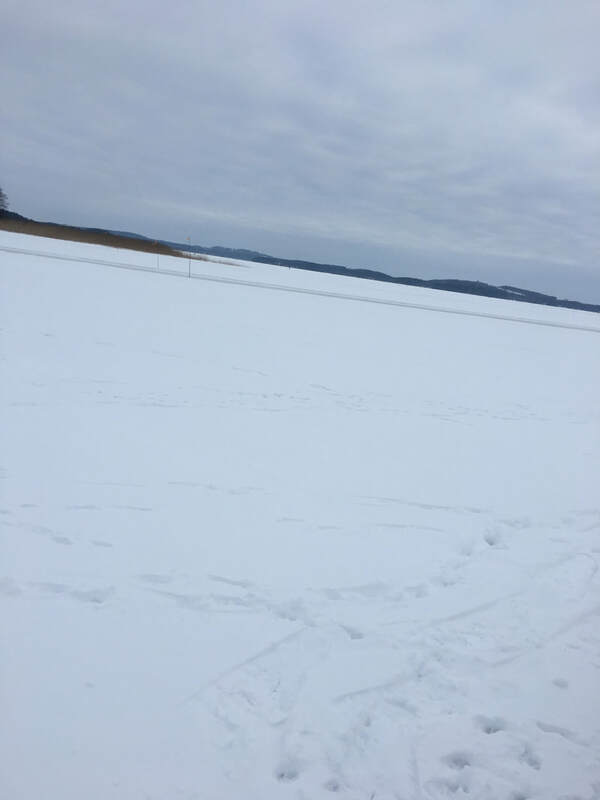 In the evening we went for a walk on the ice lake with our class mates. We walked out onto one of the islands in the middle of the lake and relaxed for a while. Out on the lake the temperature got to -17. On Friday we went to the opening of the Finland Ice Marathon. This is a 200km ice skating race which is held on the frozen lake here in Kuopio. We found this to be a really good experience as in Ireland we don't see ice never mind frozen lakes. There was music and lots of things to do there. As it was dark, the skaters wore lights and it was beautiful. All you could see were the lights out on the lake, like cars in the distance. Around 8pm there was a fantastic firework display that lasted a good 20 minutes. After this we went back to our hostel and got an early night as it was very cold out. On Saturday we got up early and went for a walk to do some shopping. Getting up early here is harder then at home as the weather makes it impossible to get warm, it is refreshing though as the air here is a lot cleaner then in Galway. After we got home we got ready to go out to our friends house from college to watch the rugby games, Ireland vs Wales and England vs Scotland. Saturday was the coldest day here so far for us. The temperature dropped to -23 degrees. We wrapped up well so we could face the cold for a while but as there was a bit of a breeze we found that taking off your glove to check the time on your phone wasn't a good idea. We found out over here it is so cold it actually effects our phones. We could charge them up and have them in our pockets but when we go to check them the phone feels so cold and the battery could be on 8% only for it to sky rocket back up to 80% when we plug them back in. We all hope this doesn't effect our phones in the long run. Today we went to get some things in town but on Sundays most places don't open at all here so we just came back to our hostel and played some games and talked to other people here on Erasmus from France. Today our supervisor split into two teams and we were instructed to design a threat type of scenario. Eoghan’s team designed a scenario where the other team was a security guard at a bar. The scenario consists of two people, with a third person who is drunk and trying to start a fight. The experience was really immersive due to the commitment of the other students, which was so interesting and made the scenario feel more authentic. It really makes it feel as if it is a genuine situation and it's something that we could bring back with us to Galway. Stephen's team designed a scenario which consisted of- an addict in social welfare office was being refused his social welfare. The other team acted as the security guards in the office at that time. Evan was put on patrol as 'Pedro' and preformed the same tasks as Stephen did yesterday. Overall the scenarios were very interesting and useful. After school we meet up with our classmate Yalla who brought us to the local pool hall where we spent the evening relaxing and learning more about the Finnish culture. On Tuesday, Evan and I were asked to make a PowerPoint on the threats that may be relevant to security workers. After we had this completed we were split into two teams with both of us on separate teams so we could interact with our colleagues better. In our teams we were given a list of assessing the types of threats one could encounter and we had to pick out one example to create a scenario, for the other team to partake in tomorrow. While we were doing this, Eoghan was sent out to patrol the campus again but this time with different members of the group. Today we acted out the scenarios that we wrote out yesterday. Evan's team went first and each member had to go through the scenario. There was a security guard in a night club where two people were starting to fight. They had to go through several steps to achieve full marks. After each member of the team was done, our teacher Peter would give feedback on what they could have done differently. My team had to act as off duty security guards that witnessed confrontation in a shop where we had to step in. Peter gave us positive criticism and told us how we could improve. These scenarios were designed to make us more comfortable in situations that are likely to occur in security work. In comparison to the Irish education system, the Finnish teach in a far more practical and hands on way. After this I was put on patrol with Antii. It took an average of 30 mins to do a full lap of the campus. This included the A, B and C wings along with all the workshops. After lunch we were given a list of rooms that we had to check to make sure that they were locked and not in use, and at the end of the day we had another list of all the computer rooms that we had to check were locked. All the students in the course are required to do a full day as campus security to prepare them for security work. After college we went to the tower in Kuopio with our class mate Yalla. It was a long walk up a staircase on the side of the hill but it was worth it as the view was stunning. The hill is covered in trees with a few feet of snow covering it all. The tower is over 100m high so we got the lift up. At the top we looked out over the city and it was beautiful. The city is a lot bigger than we had thought. It was a really clear night too so we could see to the edges of the city and beyond. At the bottom of the tower we met another friend from college who joined us for a walk through the woods back towards the city. We followed a small trail for about 2km before we reached the edge of the woods and walked back to the hostel. Today I was put on a patrol team with Yalla. This is where I patrol around the college while making sure all emergency exits are working and there is nothing odd happening. After our small break we were introduced to the coordinator of international relations - Tarja. She told us she had planned a trip for us to go to the local shopping center on the outskirts of Kuopio, and after lunch we would go to the head offices of 360 Prevent. In the local shopping centro we saw how security works in Finland in comparison to Galway. When we arrived they preformed a fire drill. We were unaware that this was happening so we were caught off guard. They had an automated public announcement system that announced loudly and clearly there was an evacuation due to a fire alarm being set off. Here we saw large automatic fire doors drop down and all members of staff and patrons quickly evacuated the building to designated fire points. We found this very interesting as all the people involved were very calm. After we were allowed back into the building we were shown to the main security office, here they showed us the the CCTV monitoring center. We were not allowed to take any pictures here due to security concerns. We then went back to college for lunch and played a game of football with some other students in the college hall. After lunch we went to the regional office for prevent 360, the second biggest security company in Finland. Here we spoke to Timo Partanen the head of the regional office. He showed us all the equipment they had including extendable batons, pepper spray and handcuffs. Each item of equipment had a different course specifically for it showing members of security staff how to use them safely and properly. This highlighted many differences in the security industry in Ireland such as the lack of protective equipment given to security personnel. It showed us how prepared all the offices were for different situations. On Saturday we got up early and had breakfast in the hostel. We went for walk on Lake Kallavesi. Here we found the ice skating centre. Ice skates were being rented off a boat that was frozen into the lake. There was a short route of 1km through the lake and a long route of 17km. We decided to take the short route as we are inexperienced at ice skating. There was also a thick icy mist out on the lake which we found to be a bit intimidating! We were also not fully equipped for the cold as it got down to -10. We spent an hour on the ice and then returned to the centre where we had hot chocolate. We decided we would come back next week better equipped and do one of the longer courses. We also met up with our class mate Yalla who showed us the local shopping centre, here we noticed many similarities between Finland and Ireland in terms of culture. The local people dressed and behave very similar to us Irish and were very friendly. We looked around a few different shops and then had coffee. In the evening we decided to go to the cinema to see a movie. Here we saw a great difference between Irish and Finnish security precautions, every door in the cinema had electronic locks and had to be accessed by a key card held by the staff, there were also a security guard for every floor in the cinema. Afterwards we got a bus back to the hostel and got an early night as we plan to go skiing tomorrow. On Sunday, we went to Yalla’s apartment to meet up with him and his roommates. Yalla told us he is in a heavy metal band and showed us some of the gigs he had played. He also explained to us that people in Finland really enjoy heavy metal music and that Finland has the highest number of heavy metal bands per capita. Yalla worked as a chef for 2 years and he cooked us a meal as he wanted us to taste real Finnish food. One thing I enjoyed were the riisipiirakka, which is a Karelian pie made of rye dough, minced meat and butter. Wednesday: Today we learned about the laws behind the Finnish security sector and realised there are many differences between the PSA (private Security Authority) and the Finnish equivalent. One of them being Finnish ‘guards’ (security personnel) have the authority to detain people in certain circumstances. This can be done by use of handcuffs. We then helped the class set up a mock role play for health and safety and a medical emergency situation. In health and safety we had to find some problems with a room such as if there was a sign missing for a fire extinguisher or an emergency exit sign wasn’t lit. It was up to the other team to uncover these problems and fix them to make the premises safe for public use. The other team had to set up a medical emergency role play where a person who suffers has type 1 diabetes needs some medical assistance. After college we came back to the hostel where we spoke on the phone with one of our classmates about going into town to watch the REAL MADRID v PSG match. It was also Evans 20th birthday today so before meeting up with Jalla we went for dinner. We had a good night and are looking forward to snow shoeing and snow frisbe. Thursday: Today was an activity day, we arrived at the college at 12 and we met our guide Pauli. He drove us and other Erasmus students down to the lake in one of the college vans. We arrived at the lake and meet up with some of Pauli’s friends and classmates, they showed us the snow shoes and how to put them on. ​After we had them strapped on we walked out onto the lake where they had set up frisbee golf. The game is set up like golf where there is a hole at one end of the course and there is a specific starting point. We played several rounds of this each had a different course lay out and obstacles to go around such as trees, reeds and a windmill. After we had finished we gathered around a fireplace and drank tea and coffee they also offered us sausages that had been freshly cooked on the grill and a traditional Finnish cake. (Tuesday) Today we woke up at 6:30 and walked to the college. We meet Peter in the lobby at 8:00 where he led us to our class. 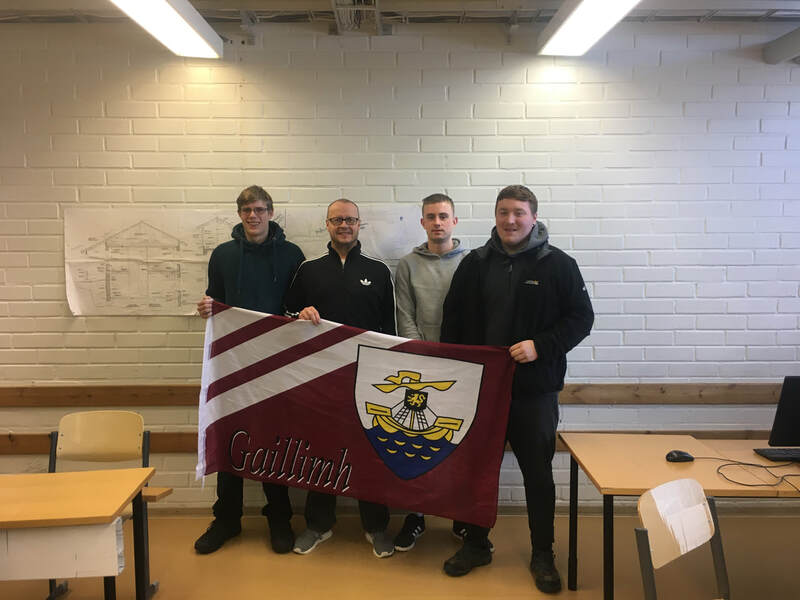 Our task was to view an overview abojt our college back in Galway and the course that we are studying. In our class we made a PowerPoint about the course we are studying in GTI and presented it to the class. At lunch we sat with our classmates and talked about the the college and how different it is to GTI and how different Ireland is to Finland. In our spare time this evening we explored the city center and the surrounding streets.